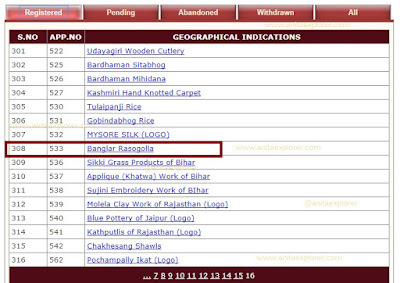 "Banglar Rasogolla" was "invented" in Bengal in 1868. 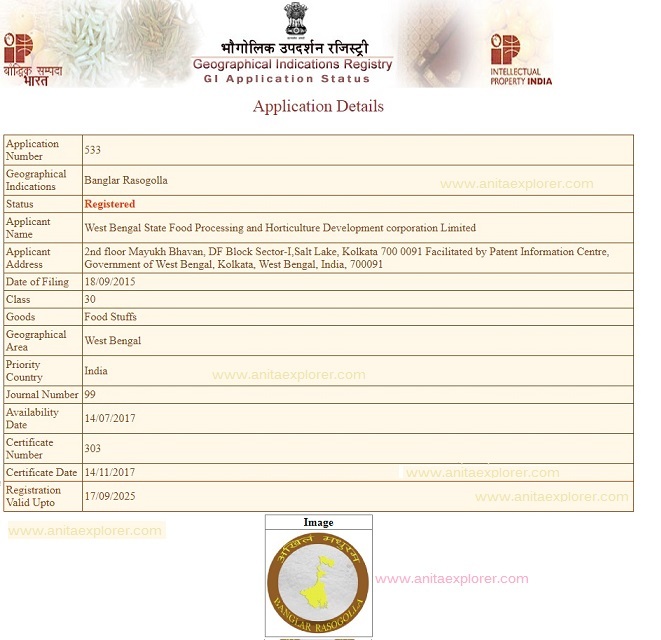 West Bengal had filed an application and has received a certificate for "Banglar Rasogolla" today. Geographical Indications (GI) Registry is a Quasi Judicial Authority. This impartial authority grants GI status on the basis of details and supporting documents. Application Number- 533 refers to "Banglar Rasogolla". It has been available from 14th July 2017. Today, on 14th November 2017, West Bengal has got the GI certificate for "Banglar Rasogolla". It may be noted that Odisha Govt. is yet to file any application for Rasagola. There is a mind-boggling choice as many varieties of Rasagola are available in Odisha. Each region has its unique preparation and specialty e.g. Pahala, Salepur, Jatni, Kukudakhandi, Nuapatna etc. If and when the Odisha Govt. files for similar application(s) for Rasagola, and the GI body receives the documents, Odisha's case will be considered. Odisha will then earn similar GI tag(s) for the number of applications filed as there are so many distinct Rasagolas available in Odisha. 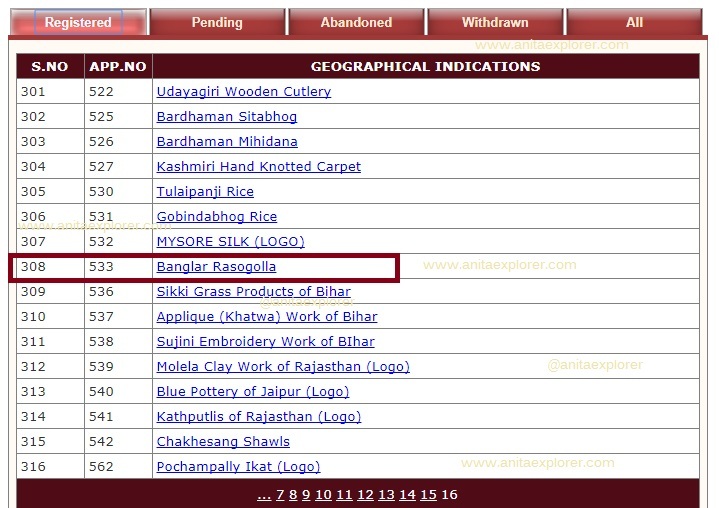 West Bengal has now got the GI tag for "Banglar Rasogolla". In this case, "Banglar Rasogolla" means "Bengal's Rasogolla or Rasogolla of Bengal"; and certainly NOT "Rasogolla originated in Bengal (and not in Odisha)". It is pretty disappointing to read the incorrect and misleading headlines in most media. I spoke to the official sources at Geographical Indications Registry, Chennai, and shared the above news-reports with them. They expressed their shock and wanted to know "why such controversy has been unnecessarily created". There is documentary evidence that the sweet Rasagola indeed originated from Odisha. Many are yet to know that Rasagolas have been associated with Puri Jagannath Temple culture and Ratha Jatra for centuries. On Niladri Bije, the last day of the Ratha Jatra, devotees offer Rasagolas as 'bhoga/prasad' to Lord Jagannath. Also, Lord Jagannath is allowed to enter the Temple only after He offers Rasagolas to His wife, Goddess Lakshmi. MaLakshmi and Lord Jagannath's conversation is called 'Bachanika'. Gifting sweet Rasagolas sets things right even for the Lord of the Universe! In Social Media, #RasagolaDibasa is being celebrated on Niladri Bije from 2015 onwards; the maiden celebration was on Niladri Bije of the Nabalakalebara Ratha Jatra. It is an attempt to share facts, spread awareness and to change incorrect perceptions. Unlike popular belief, Rasagolas originated in Odisha and Rasagolas were being served in Odisha much before "Banglar Rasogolla" originated in Kolkata/West Bengal in the 19th Century. The 15th Century Dandi Ramayan i.e. 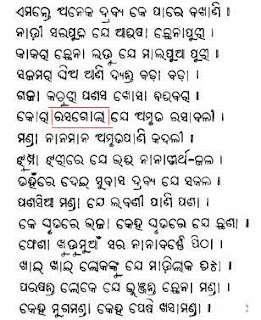 Odia Ramayana and other ancient texts like Madala Panji provide evidence as 'Rasagola' finds mention in them. True to the official authorities, most of the media reports about the present GI status of "Banglar Rasogolla" have been controversial in nature and have misquoted the officials. As per GI officials, the distorted reports seem to be motivated by vested interests and "brand creating strategy". What else can we expect from the media now when "Fake News", a term popularised by U.S. President Donald Trump, has been named as the word of the year 2017 by Collins dictionary due to its widespread use around the world! It is pretty immature, unprofessional and unethical when some journalists are dictated by passions of a different type and do not bother to clarify and/or intentionally present news in a biased and unfair manner. We expect and demand a responsible media. Interesting to note that today happens to be Children's Day in India! I guess love for Rasagola and claim for Rasagola brings out the child in all!!! P.S- More than 100 pages document with all documentary and historical proof of Rasagola's Odisha origin has been submitted to the Department of Industries, Govt. 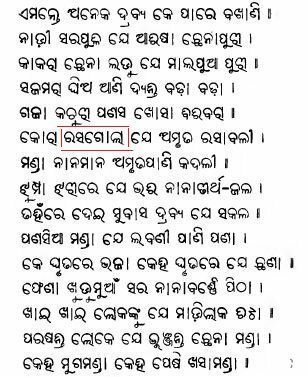 Of Odisha, by cultural researcher Shri Asit Mohanty last year. The facts should soon come to light for the world to know the real birthplace of the Rasagola. How can we stop fake news? Do you like Rasagola? 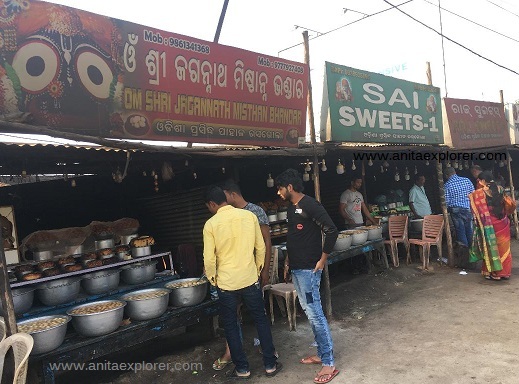 Did you know about the traditional Rasagola connection with Odisha? Have you celebrated #RasagolaDibasa online? Do share in the comments below. Do read my article- The Rosogolla Race: Odisha’s Inaction, West Bengal’s Gain published in The Quint. Thanks for providing facts about Rasagola.. Quite interesting. Very well and correctly written. Media feeds on creating controversies and divisions. We are proud that Rasagola has originated in Odisha and it is the favorite of our dear Lord Jagannath n Mahalaxmi. Sleepy Odisha govt officials need to be whacked in the bum to get up and present that brilliant historical evidence of Odisha as birthplace of rasagola. Thanks to the non Odia officers and the almost non Odia CM's disinterest in representing odisha, the Bengal tiger has marched a step ahead. Hope now these callous people will file an application on Odisha's behalf and establish the lesser known truth that Odisha is the real birthplace of rasagola. Really sad that despite having historical and cultural association and relevant evidence, Odisha has been unable to "prove" the true birthplace of the Rasagola to the world. Media has played a great role in misreporting, misquoting, suppressing info; thereby depriving readers to learn about the reality. Nice way of understanding the issue. Let us face facts instead of going hyper. That is the right thing to do. Yes, the right thing to do is to face and accept facts and history. Fact is Rasagola has more than 800 years cultural association with Odisha and it's still offered as bhog during Ratha Jatra, Puri, Odisha. Sad that such controversy has been created despite evidence about Odisha being Rasagola's place of origin. Do visit Odisha and taste the ones available here. In a larger scale the same drama is happening with many ancient Indian inventions. When we neglect our own native cultures and blindly follow other cultures, others start taking credit for our inventions. Some westerners have started claiming that yoga, Sanskrit etc., had originated in the west. Proper documentation, spreading the right awareness and sharing historical and cultural evidence and information can counter false propaganda and unfair claims.